In August, the U.S. Army Corps of Engineers asked the Community Engagement Core at Oregon State University’s Superfund Research Center to give a fireside chat about mercury to 35 campers at the Pine Meadows Campground which is on the shores of the Cottage Grove Reservoir. This recreational area is about 35 miles southeast of Eugene, and about 10 miles downstream of the abandoned Black Butte mine which was one of the largest mercury mines in the state in operation from the 1880s until the 1960s. Barbara Hudson-Hanley, a public health doctoral student, gave a short talk describing how mercury can move through the environment, bioaccumulate in fish, and affect human health and then led the campers through two activities. The first activity illustrated bioaccumulation. Using pink and yellow cards, campers were assigned different roles. Children under 5 years old were “the microbes” and were tasked with gathering as many pieces as paper as they could in 30 seconds. Slightly older children were the “small fish” and could either “eat the microbes” by taking the younger children’s colored paper or pick up more cards from the ground. Teenagers and adults were the “big fish” and could “eat the small fish”. Throughout the game, the colored pieces of paper were counted. With yellow pieces of paper representing mercury, the data showed that on average microbes picked up 2 yellow and 10 pink cards, the small fish picked up 5 yellow and 20 pink cards, and the big fish had 10 yellow and 25 pink cards. 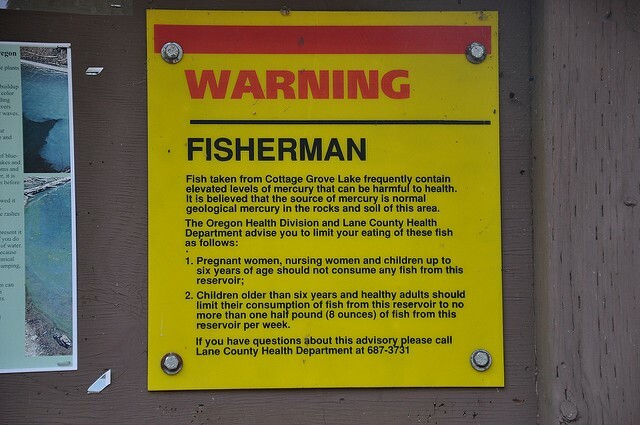 Since fishing is fun and eating fish low in mercury is good for you, the next activity helped people learn about the different fish species in the Cottage Grove Reservoir and their potential to contain mercury. Children were given small fishing poles and were encouraged to “catch” laminated cut-outs of resident fish that spend their entire lives in Cottage Grove Reservoir, such as the Northern Pikeminnow and Catfish, and migratory fish, such as salmon and steelhead. With their siblings and parent’s help, they were tasked with identifying their fish against a poster that had the different types of fish and their average mercury levels and determining if they should eat that fish or not. 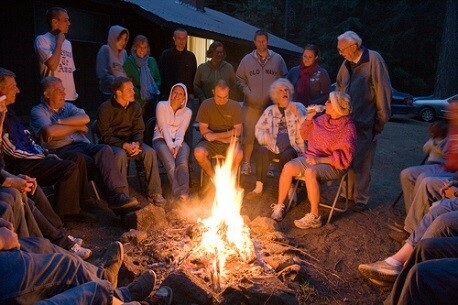 These activities provided useful information to campers that reinforced the concepts that recreational activities like fishing are fun and that eating fish is good for you, but that it is important to be aware of you environment and potential hazards so that you can reduce your exposure to potentially harmful pollutants like mercury. The feedback we received from the fireside chat was overwhelmingly positive. Several campers lingered afterwards to talk to Christy Johnson, from the U.S. Army Corps of Engineers to discuss more about how mercury got into the Cottage Grove Reservoir and what policy actions have been taken to clean up the abandoned mine. The article, “Environmental and individual PAH exposures near rural natural gas extraction” was recently published online. It isn’t uncommon for our researchers to publish the results of their work in scholarly journals. You can see we have been busily writing articles for years! This article however, is somewhat special. When we began this work, we committed to returning all the data, both environmental air sampling data and personal wristband sampling, back to the participants. That’s a big undertaking. We didn’t want to just hand over confusing charts and color-coded Excel files; we wanted to provide data that was useful and relevant to people. It’s important to us that we get it right. We’ve held focus groups and worked with community liaisons to figure out how we can do just that. Even while the article was under review, we worked with the team of scientists that performed the research as well as computer programmers, data visualizers and community engagement & research translation experts to develop reports that detailed why the research was done, what was found, and the public health relevance of that research. The data was contextualized for every person – our computer programmer built codes to ensure that every single person received a personalized report. The reports were reviewed internally at Oregon State University and the University of Cincinnati, and externally by community liaisons. The Research Translation Core provided materials relevant to PAHs (the focus of the study) and helped craft the reports. So when our article was published, it didn’t just represent a contribution to the existing body of literature; it also represented over 30 personalized reports being mailed out to the individuals that not only participated in our study, but helped drive the research forward. Posted in Community Engagement, Publications, Research Translation, Science Communication. 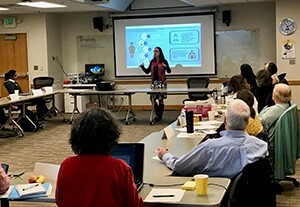 The Research Translation Core, represented by Dr. Diana Rohlman, was invited to attend and present at the 14th summit of the Northwest Toxic Communities Coalition. Dr. Rohlman’s talk highlighted the innovative tools, methodologies and approaches used by the Superfund Research Program at Oregon State. One of the presented case studies highlighted the work being done at the Portland Harbor Superfund site. More information can be found here. Excerpted from the event summary: “Dr. Diana Rohlman kicked off the day with an introduction to research being done by the Oregon State University Superfund Research Program. Her talk emphasized the complexity of pinning down risks from manmade chemicals like Polycyclic Aromatic Hydrocarbons (which are chemicals released from burning substances or during oil spills and also used in consumer goods like air fresheners) when environments like Portland Harbor are contaminated differently over time and when the effects of a given chemical often depend on which other chemicals are present or on the specific sensitivity of the exposed individual. She also pointed out that bioremediation can be problematic because chemicals are sometimes broken down into even more toxic metabolites. This means that bioremediation may sometimes successfully eliminate one compound from an environment only to replace it with something even more toxic.” Read the full article here. Posted in Events, In the News, Research Translation, Science Communication, Science Education, Uncategorized. Native Americans have a long history of being under-represented in higher education. Currently, only 5% of Native American high school graduates go directly into a four-year college and a small percentage of those major in STEM-related degrees. In an effort to increase participation of Native American students in college programs, and introduce them to biomedical sciences, Oregon State Superfund Research Center holds several activities to bring Native Youth to campus to increase their awareness of opportunities in College and scientific careers. On May 20, over 20 tribal youth and chaperones came to Oregon State University for a campus tour, student panel and the 41st annual Klatowa Eena Powwow. (Klatowa Eena is Chinook Wawa for ‘Go Beavers.’) SRP trainee Sydelle Harrison, who is part of the Community Engagement Core (CEC), worked with the Research Translation Core, the Training Core and SRP Administration to procure funding and organize the daylong event. For the second year in a row, Sydelle worked with youth organizations to bring students from the Confederated Tribes of the Umatilla Indian Reservation and the Confederated Tribes of Warm Springs. The 20+ students started at Callahan Hall, where SRP trainee Amelia Allee, (CEC), and University Housing and Dining Services staff took the students through the freshman dormitory, highlighting the shared lounges and kitchenettes, and showing the students a dorm room. Following the dorm tour, Athletics staff took students on a tour of Reser stadium, including a tour of President Ed Ray’s box, and provided them an opportunity to run on the field. Up next, was the OSU Basketball Center where the students (and chaperones) took to the court. After working up an appetite, the dining halls were next, followed by the Powwow. To finish off the day, SRP trainees hosted a pizza dinner. Here, students had the opportunity to ask trainees questions about college, graduate school and SRP research. Two tribal elders attended, giving the youth their perspective regarding the importance of college. SRP trainees and faculty answered questions about the value of community college, the typical length of a college degree as well as opportunities for distance learning at the OSU satellite campuses. Many thanks to Sydelle Harrison; without her these tours would not be possible. In addition, many thanks to Amber Kramer, Carolyn Poutasse, Alix Robel, Amelia Allee and Drs. Molly Kile, Diana Rohlman, Craig Marcus and Robert Tanguay for their help. Posted in Community Engagement, Events, Science Communication, Science Education, Training.